This 12 Volt 25 Ah Battery is a Sealed Maintenance Free AGM Battery that produces 300 CCA's. Giving your toy the power it needs to come alive and bring a smile to your face. No more fumbling for the jumper cables or the jump box, AGM battery technology has one of the lowest discharge rates of any existing battery technology on the market. This mottBatt MBTX24U 12 Volt 25 Ah Battery is a Sealed Maintenance Free AGM Battery that produces 300 CCA’s. Giving your toy the power it needs to come alive and bring a smile to your face. No more fumbling for the jumper cables or the jump box, AGM battery technology has one of the lowest discharge rates of any existing battery technology on the market. Typical PowerSports battery design have not changed for years. MotoBatt Battery has studied the way PowerSports batteries are used in market today and what applications demand what or where the ‘Triple Threat” becomes the issue effecting battery life and/or performance. Motobatt’s innovative internal ‘Power Balanced’ design has been developed to overcome these problems. Many claims are made by different manufacturers about cranking capacity in fact there is little to be gained from a battery that cranks harder than what is required to start your bike. In battery design there is always a trade off. Since physical battery size is limited by the application / case size, the more cranking power (increased number of thinner plates) you have, the less Amp Hour capacity you get, and vice versa. The key is to ‘balance” the design to offer maximum AH and CCA’s to properly power all of your ‘thirsty’ OE and aftermarket accessories. MotoBatt Battery is the world’s only premium AGM factory activated 4-terminal powersports battery. Factory activated – Plug-n-Play – ready to install right out of the box. High density oxides provide maximum power-per-square inch. Guaranteed long life! AGM Batteries have a very ‘high cycling’ characteristic not found in other battery technology or chemistry like traditional lead acid batteries. Providing the user with a long reliable service life. MotoBatt Battery is a manufacturer of unique premium Powersports batteries, Battery Chargers and Battery related accessories and providing common sense solutions for enjoying the use of and/or riding pleasure of your PowerSports vehicle. MotoBatt Battery Inc. holds patents all over the world for the MotoBatt 4 terminal PowerSports battery that facilitates flexible battery installation across a wide variety of PowerSport vehicles while maintaining an OE like fit. MotoBatt is the Official Battery of AMA PRO RACING in both the Road Racing and Flat Track venues. 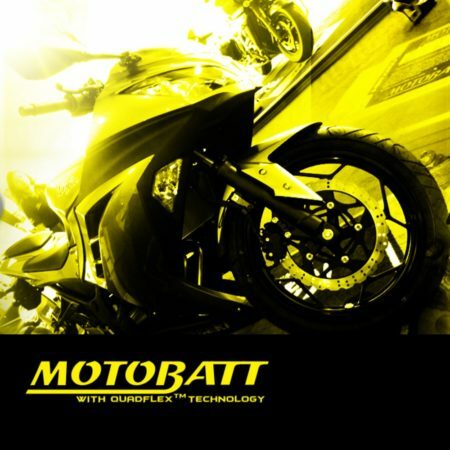 MotoBatt is also a member of the Motorcycle Industry Council and Battery Council International. Please verify the dimensions of your existing battery and terminal configuration to ensure this is the proper battery for your toy. Be the first to review “Motobatt MBTX24U 12v 25Ah AGM Battery” Click here to cancel reply.